Having a baby or toddler can be hard work, so it’s just normal that you do not have the time for an extensive beauty routine. And even being pregnant makes me sleep much less than before. Because of that it doesn’t come surprising that I often wake up with deep deep circles around my eyes and scare the the living day light out of the man that is unfortunate enough to be my post man. As I am not brilliantly talented when it comes to applying make-up, I tend to just chuck on a bit of foundation and mascara to hide the obvious, but especially when I am tired I often find myself rubbing my eyes and smearing my mascara all over my face. 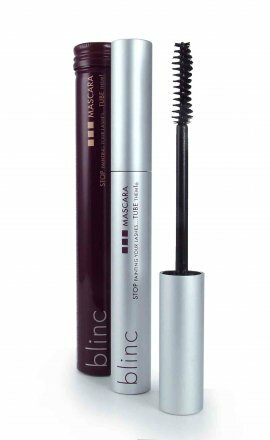 You can imagine how delighted I was when Blinc UK offered me to review their new mascara that does not only promise to be water-resistant but also to be smear-prove while still adding both volume and length to your lashes. At £18.99 the mascara is a bit pricier than your average mascara but I have to admit it absolutely stunned me. I have tried dozens of mascaras promising to be water-resistant and none of them actually are. Blinc mascara truly does the job. It forms tiny tubes around your lashes and once applied, the tubes bind to your lashes and cannot run, smudge, clump or flake, even if you cry or rub your eyes. And believe me, I have taken it to the ultimate test. I used it running though the rain, I purposely rubbed my eyes and I cried while watching a sad film. Nothing happened: the mascara stayed where it should be, it didn’t clump and it didn’t make my lashes stick together. With my mascara I did also get a lovely primer (£12.80) that nurishes my lashes and an eyeliner (£18.50) that makes my eye make-up look more dramatic. Until now I never thought of using a primer, but it really does make a difference. My lashes are more flexible and the coating makes them look longer and thicker, which gives them an overall healthier look. I know that you still might think that £50.29 for all three items is a bit steep, but I have noticed that I use less of each product so I think that overall I might even save a bit of money. And if you aren’t sure if the Blinc products are the right thing for you, you do not have to spend a furtune, just get a trial size and see if if works for you how it works for me.